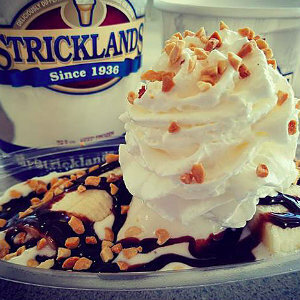 After 15 years in business, Strickland’s Ice Cream since 1936 in Irvine will be closing. The Irvine store was the first to open outside of Ohio and brought the beloved signature ice cream to OC. You can stop by to say your "goodbyes" and "thanks" through December and enjoy its hand-dipped, exceptional quality ice cream. You can always find chocolate, vanilla, Pineapple Dole Whip, and rainbow sherbert, and then there are two to three flavors of the day. Check online here to see what the flavor of the day is. Flavors can range from Coffee, Peppermint, Taro, Reese’s Cup. Mocha Chunk, Strawberry, Green Tea, and Egg Nog and much more. They also offer sundaes, hot fudge brownie sundaes, banana splits, banana bowls, strawberry shortcakes, ice cream sodas and more.